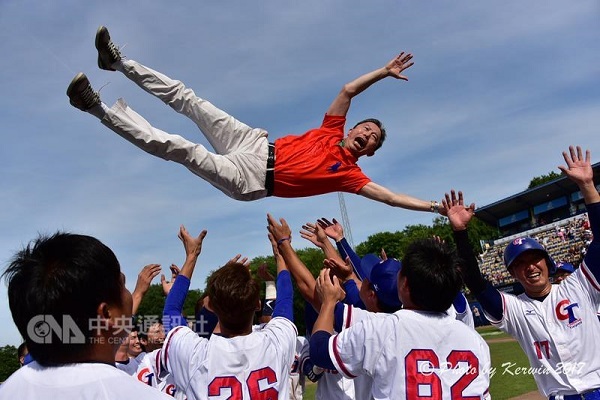 TAIPEI (Taiwan News) — Earlier this summer Taipei defeated the Netherlands in the 2017 Port Baseball Tournament in Rotterdam, yet excitement over a photo of fans waving a Chinese Taipei flag on the Tournament’s official website is stealing more bases with home crowds than the win. At first, Taiwan was not invited. The South Korean and Japanese teams, for instance, each sponsored their national teams to the tournament because the organizers were not able to cover the costs of all teams to participate. It was assumed Taiwan could not pay. Jack Wu (吳名T), the popular Taiwanese business mogul of Ultima Electronics, first learned of the team’s missing invitation when he called the Tournament organizers to inquire about his own missing invitation. The Taiwan team had participated 10 times in the tournament and Wu did not want to see them benched now. He quickly pulled his resources and notified the appropriate channels. Upon learning that financial backing was missing, the Taiwan External Trade Development Council, China Airlines, EVA Airlines, and the Tourism Bureau combined forces to sponsor the Taiwanese team. Taiwan’s team soon received their invitation. The Rotterdam crowd enjoyed 9 days of Taiwan-related advertisements as the competition went on. The commercials promoted Taiwanese industries, culture, and landscapes. Even the Taiwan national anthem was played. The most moving of all however was said by fans and athletes alike to have been the sea of Taiwanese flags waving from the audience, a picture of which was still standing on the tournament’s website. Not only is baseball one of Taiwan’s strengths on the field, but the sport has also provided many moments of national pride and international recognition, commented state representatives, and the potential for economic expansion.